Northern Brewer hop pellets. 8-10% AA. Clean bittering with a nice aroma. Woody and earthy with slight minty notes. 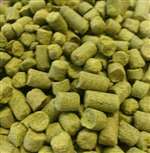 A dual purpose hop for all ales and lagers. The signature hop for the California Common beer style. Use Hallertauer, Mittlefrueh or Nugget for possible substitutions.